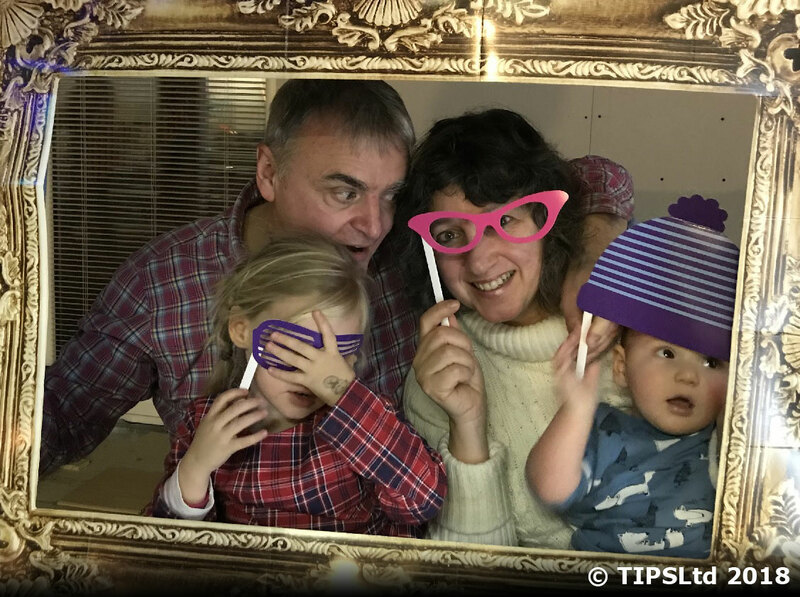 Mrs 50 Plus spoke to mother of five Sharon Trotter about her family and why she became a Midwife, Parenting Consultant and founder of TIPS Ltd.
Who exactly is Sharon Trotter and what do you do? Calum Jon Trotter was born by emergency caesarean section on 29th March 1986. He was diagnosed with hydrocephalus shortly after birth. This is a congenital abnormality of the brain, which means that fluid builds up causing increased intra-cranial pressure. Calum was transferred to Yorkhill Children’s Hospital with me at one day old. He was operated on a few days later and appeared to recover well. Calum was a beautiful, bright baby who strongly resembled his father Aidan. He breastfed well and was soon putting on weight, after his traumatic entry into the world. At ten days old, Calum was discharged home with his doting parents. He was everything we had ever dreamed of and we couldn’t wait to start family life together. My mother and brother flew up to Scotland to meet the new arrival and they spent a wonderful week getting to know Calum. The week went far too quickly and it was soon time to say goodbye. They flew back on Saturday 19th April. Calum was rather fractious on the Saturday night but we put it down to all the excitement of that day. He fed well at 03.00am and was placed in his cot in the nursery, adjoining our room. The following morning, at three weeks old, Aidan found Calum dead in his cot! This moment changed the lives of many people, non more than us. No real reason was ever given, although Cot Death was mentioned. 32 years later, Calum is as much a part of the Trotter family as any other member. We went on to have four more wonderful children; Ashley, Jason, Miles and Mitchell, who from a young age, have been told all about their big brother Calum. He may not be here in person but he lives on in every one of us. After going through such a traumatic experience I felt I wanted to use my skills as a midwife and a mother to help new parents to cope with the enormity of looking after a new baby. I wanted them to know I was there if they felt isolated or vulnerable because I totally understood how this felt. So in reality, all I have done in the world of parenting is down to our first son Calum and his impact on our lives. So, Who is Sharon Trotter? I am a 57 year old midwife, mother of five (see above) and independent Parenting Consultant, advising and promoting best practice in breastfeeding and baby skincare. I graduated with my BSc at the age of 42 and following publication of various articles in a number of peer-reviewed journals, I helped implement a new policy for baby skincare within my local NHS organisation in Scotland. Maternity units all over the UK and beyond are updating their policies in line with this simplified approach, now recommended by the DofH and in line with the Postnatal Care Guidelines (July 2006) published by NICE. In 2004 I founded Trotters Independent Publishing Services Ltd aka TIPS Ltd as a way to self publish my book Breastfeeding the Essential Guide. In 2007 TIPS Ltd launched the unique TIPS Award Scheme. Through this scheme parents test products on a strictly volunteer basis. This means that the TIPS Award Scheme is the most respected and impartial testing programme in the baby and toddler market sector. Is work important to you? The one-to-one interaction I have with new parents on any number of issues is the most rewarding part of my work, although I would rather call it a vocation. In your job you must see the NHS in action a lot? Does it make you angry when you hear people criticising the NHS? I voluntarily de-registered as a midwife in 2014 so I no longer practise clinically. However, I regularly remain in contact with new parents in my role as parenting consultant with TIPS Ltd. Of course, I was lucky to be working in the NHS when funding was much better than it is today. I do admit to feeling sad that investment has dropped so much that adequate staffing levels are hard to maintain, resulting in parents getting less help and support. However the NHS continues to be a leader in maternity care, which is envied the world over, so I would always be the first to stick up for the excellent services that we, all too often take for granted. If you had a magic wand and there was one thing you would implement tomorrow to improve things in The NHS, what would it be? More investment, paying student midwives a living wage to train (as was the case when I trained) and giving all pregnant women their own named midwife with one-to-one care in labour. Sadly this is no longer a reality. I am not sure I will ever retire although I am already making changes to ensure that I can spend more time with our children and grandchildren. How is your life different now than when you first entered the world of work? What is your biggest fault? And your best quality? I find it hard not to get emotionally involved but then this could be seen as a quality too! Which 3 pieces of advice would you give the 20 year old Sharon Trotter? Make time for yourself and look after your back! Tell us about your family. Did becoming a parent, change you? I had always been the sort of child that loved looking after other people’s babies. I remember as a 12 year old knocking on neighbours doors asking if I could take their baby’s out for a walk in the pram (imagine that happening today) and the mothers would let me! You’re a grandmother now Sharon, is your relationship with your grandchildren different than with your children? Would you say you were more relaxed? I had heard a lot about becoming a grandparent and how it was so wonderful but nothing could have prepared me for how amazing it actually is. I thought I would feel slightly removed from my grandchildren, as I am not their parent. However I feel the same deep love and protectiveness that I feel for my own children. Happily I don’t have to discipline them and it’s great to be able to spoil them without feeling guilty. I can leave all the difficult choices to my daughter and son-in-law, so all in all us grandparents get the best bits but without the sleepless nights! Where do you like to go on holidays and who with? I love New York (we have been there four times now) or city breaks, but we (hubby and I) are still happiest if we take the two younger boys (21 and 18) with us. Family holidays with the older children and grandchildren will hopefully become more common too. I love taster menus, especially with a wine selection, so I don’t have to make any choices! As Good As It Gets with Jack Nicholson – because we are all a little mad underneath! The Outlander Series (1-8) by Diana Gabaldon. I also love the TV series which all three of my sons have played extras in. Pierce Brosnan or Daniel Craig? I loved your feature on Sharon, I was very lucky to hear about Sharon back in 2007 or so when my journey into starting my own business as a work at home Mum, who had nursed both my own sons, and was passionate about promoting the joys and benefits of breastfeeding through a soft, tactile breastfeeding, educational resource Mum and back doll set I created to show the bond and attachment between Mum and Baby. ( Hidden magnets in the Mum and baby showed and allowed them to kiss, hold hands, cuddle and show breastfeeding positions) my business took many turns, and sold to families, midwives, hospitals, schools, breastfeeding groups, child minders, children’s centers, pre and post natal groups, it was an incredible adventure and a very proud period of my life, sadly I took the tough decision to end in 2012, with all stocks proudly sold,! Sharon and I have remained in contact throughout, but have amazingly never actually met! But always promoting, supporting and chatting online) I used to donate my doll sets, for Sharon’s competitions, and wrote reviews and articles.